I don’t know who these kids are, but they made an awesome animation video based on my book, IGNORE EVERYBODY. Wow. What an honor! Thanks! Killer animation! Great material to work from. Nailed it. But was it a compliment or more of a tribute? Congrats Hugh. Love your work. Hi! 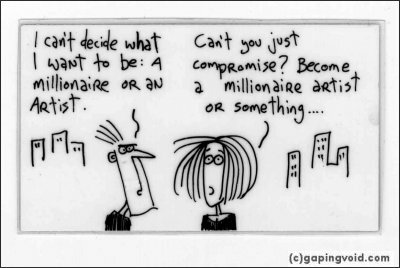 I started to read gapingvoid just recently and I’m impressed! I’d like to buy Hugh’s book, but, unfortunately, amazon doesn’t allow shipping to Poland, where I’m from… Does anyone know an European bookshop with the book available? Would be grateful! Ummm. Well. Actually the animation adds nothing to your story and thoughts Hugh, if anything it get in the way. Animation is a great tool not used well here. Shame really. Meh. The “artistic” presentation gets in the way of the message. It’s totally not clear what the problem with the water cooler gang is. On a positive note, I got the book recently and it rocks. Well crafted with potent messages, and lots of humor. Good reading for any length of time whether you have 5 minutes or 3 hours. $25 hurt a little, but it was worth it.